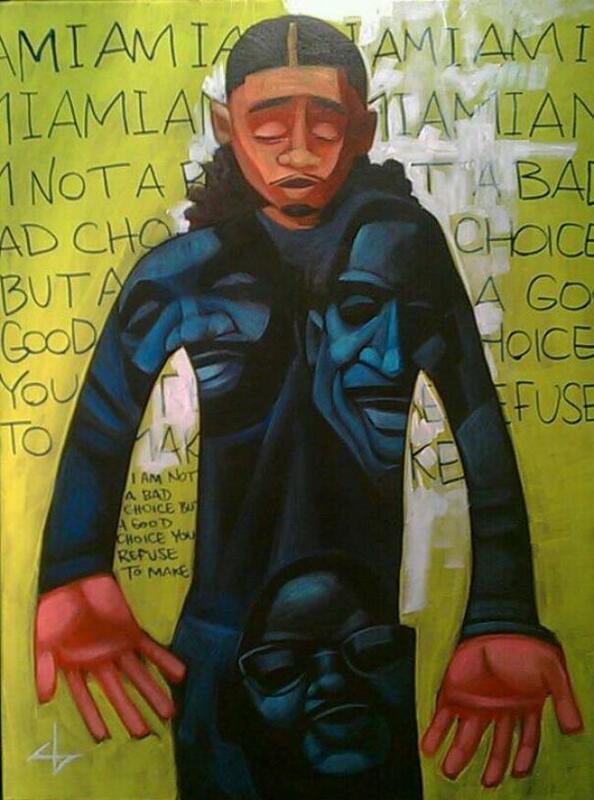 This painting is now in a library. Bayoc holds Ajani with Jurni standing by. 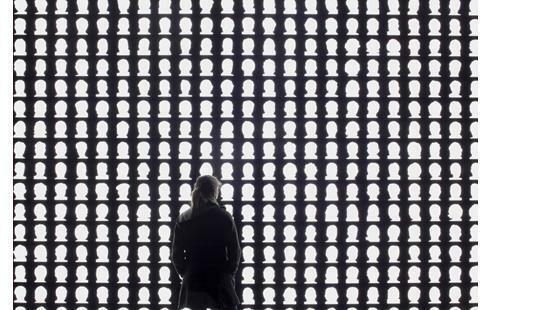 *On Thursday, Cbabi Bayoc completed the final piece in his "365 Days with Dad" project. On Friday, he spoke about the project on St. Louis Public Radio's arts and culture talk show Cityscape. This article has been updated to include the audio from Cityscape. 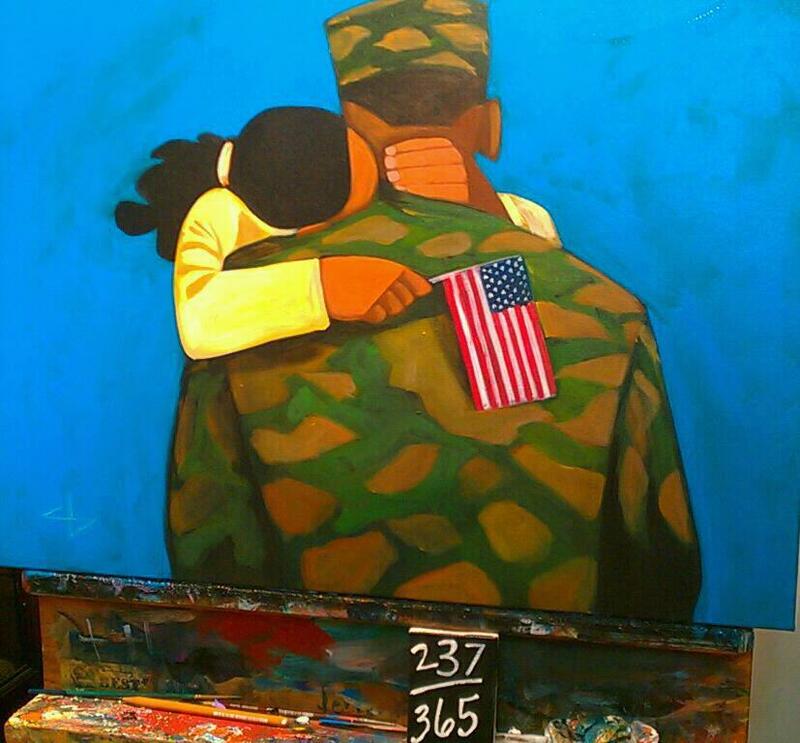 Tonight, St. Louis artist Cbabi Bayoc plans to finish his masterpiece: the “365 Days with Dad” project. Hear Nancy Fowler's story about Cbabi Bayoc's mix of painting and parenting. Cbabi Bayoc discusses the completion of "365 Days with Dad" on Cityscape with host Steve Potter. 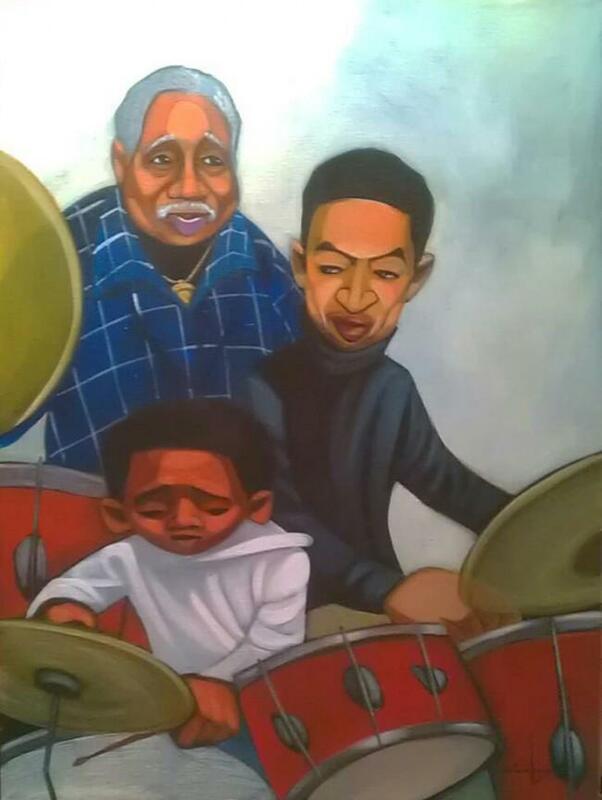 Bayoc launched his series of paintings of African-American fathers as a year-long effort, chronicled by the St. Louis Beacon in an extensive series called "The Art of Fatherhood." But it turned into a two-year endeavor for reasons including the fact that the father of three spends as much time parenting as he does painting. When Bayoc began “365 Days with Dad,” his daughter Jurni was 11. Now she’s blossomed into a teenager, who’ll start driving in three years. 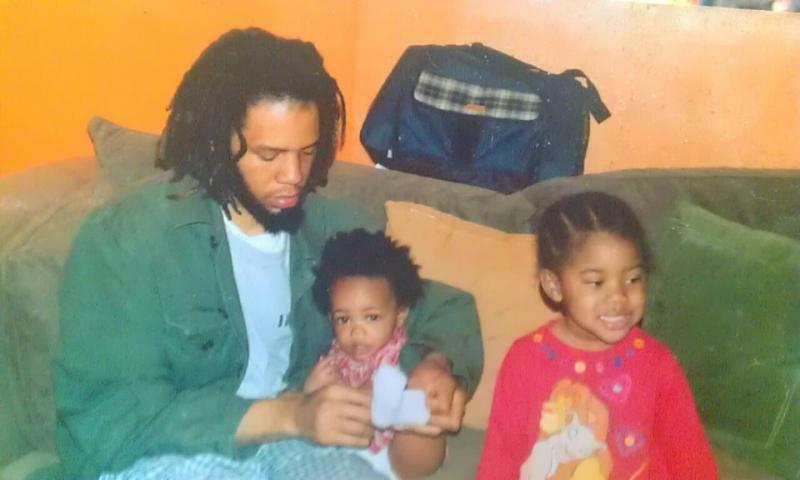 For now, Bayoc’s the one driving Jurni and her younger brothers Ajani and Borago around, living what he paints: An African-American dad folding into his day the thousands of simple acts that make a man a father. "I go get the kids at 3:30, come home, sit down for a second, maybe paint a little more, get them to wash the dishes -- just parenting stuff,” Bayoc told St. Louis Public Radio and the Beacon. Bayoc began his series of fatherhood portraits out of necessity. 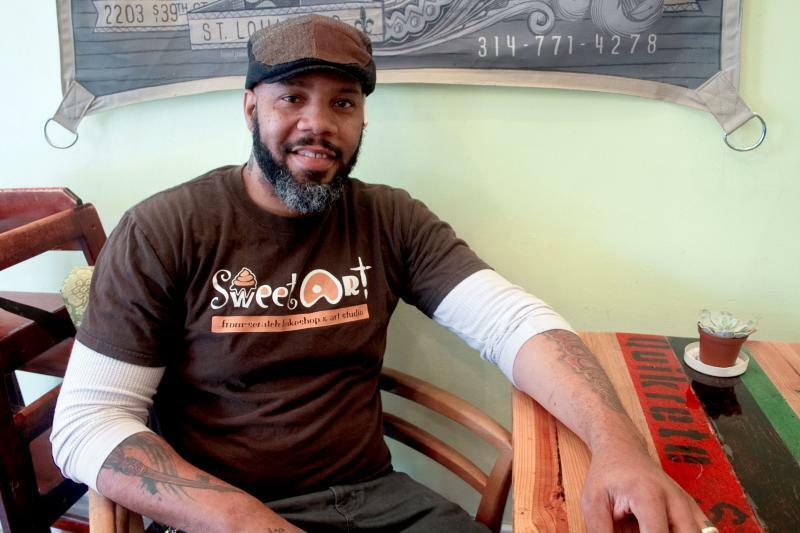 His canvases and his wife’s cupcakes and cookies from their SweetArt Bakery and restaurant in South St. Louis City weren’t bringing in enough money. 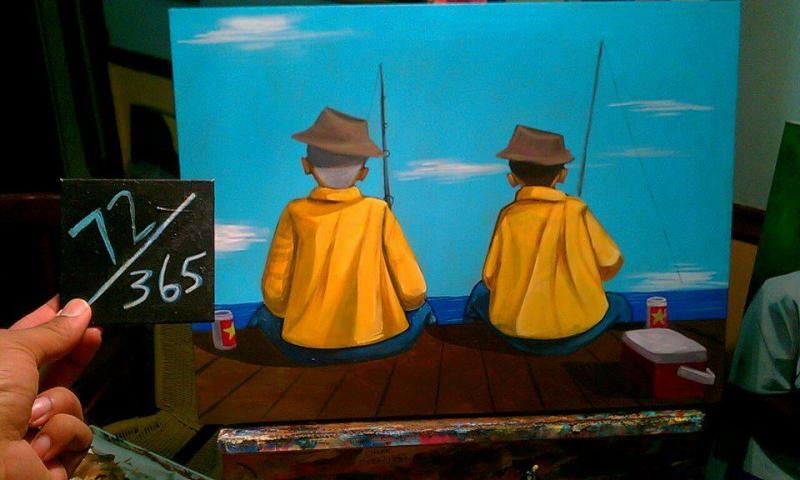 So they wondered: What if Bayoc painted one father-themed picture every day for a year? Like many best-laid plans, the project developed snags. Being a father often took precedence over painting fathers. As the series dragged into its second year, Bayoc took on other painting jobs and his daughter Jurni noticed some visible changes in her father. “At the start of it, it was interesting but in the middle I noticed he needs to sleep a lot more because he was getting a lot more gray hair,” Jurni said. Sleep is indeed an issue, Bayoc said. He paints as much as he can during the day. But he often has to work while his family sleeps. Over the course of “365 Days,” Bayoc filled his canvases with images from inside his head and from special requests from buyers, including family photographs. 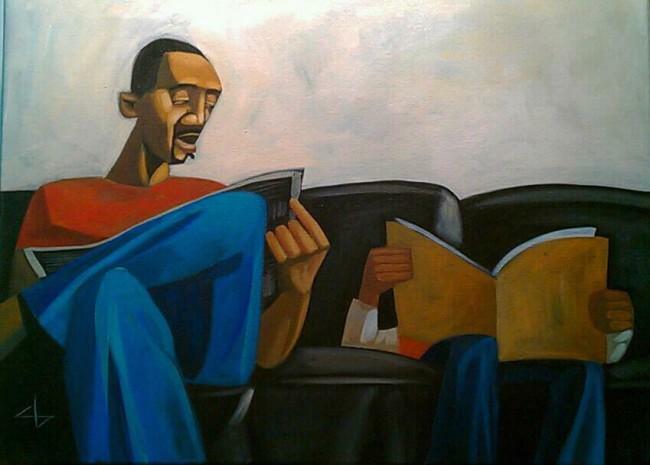 One painting shows a father and son reading on the couch. It hangs in the library of an elementary school in Arkansas, a quiet testimony to the power of a good example. 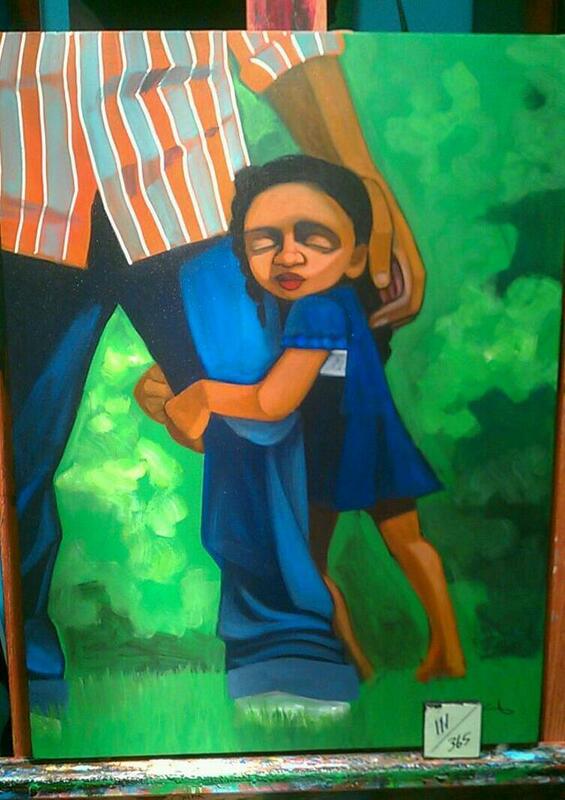 Another features a little girl wearing a royal blue dress and clinging to her father’s leg. The child -- who’s now a woman -- wore the dress to her daddy’s funeral when she was only 3. Bayoc’s own father died when he was 11. He remembers their fishing trips and motorcycle rides. He passes down that fatherly influence by helping the boys with their art projects. Eight-year-old Borago likes his father’s style. 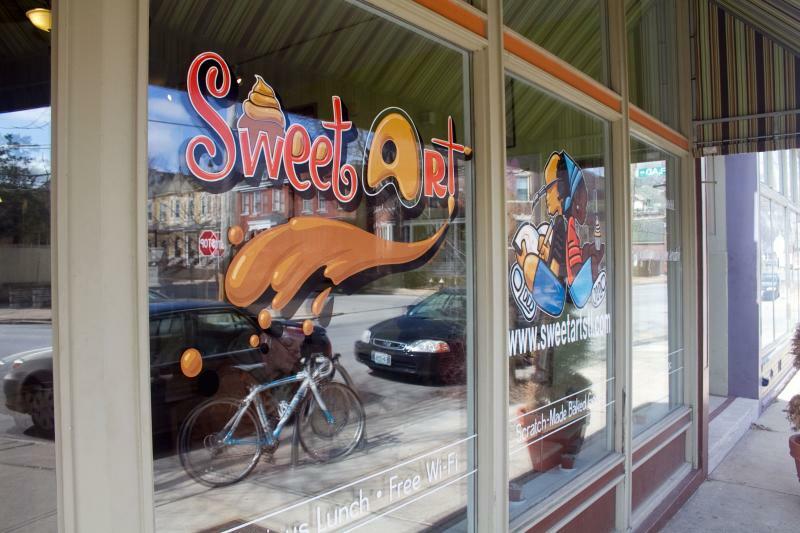 “I try to use my drawings and his drawings because he taught me how to draw,” Borago said. Ten-year-old Ajani also recalled some of the ways his father was there when he was younger, and now. “He taught me how to tie my shoes and he helps me when I can’t find the meaning of a word in a book or something,” Ajani said. Bayoc also helps his daughter with her own creative endeavors. She’s often at his side when he delivers the wedding cakes that his wife has created. “[He taught me] how to set up weddings and more about photography, because that’s what I’m interested in,” Jurni said. Angela Williams of Dallas knows Bayoc from when she lived in St. Louis, her home town. She also knows the the importance of a father who’s involved in the minutia of his children’s daily lives. Her ex-husband has coached their 12- and 18-year-old boys’ sports teams, taught them to make brownies and taken them to Sunday School. Soon, painting number 365 -- the last in the Bayoc series -- will be displayed in Williams’ home. 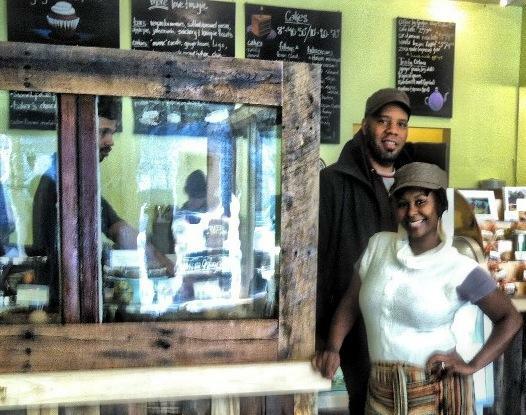 “About a month into his venture I said, ‘I want to be the last one,’” Williams said. Williams didn’t ask Bayoc to create any specific image. She wanted him to use his imagination. After “365 Days,” Bayoc will get right back to work on several upcoming projects including a book and a traveling exhibition of the fatherhood paintings. Another commission is a series of nine-by-eleven-foot murals at the Missouri History Museum, that he’ll paint over a five-week period with the help of local children. But first, a toast, to the completion of “365.” Bayoc plans to celebrate with friends and champagne. Cbabi Bayoc's wife Reine Bayoc talks about the project in this 2012 video. Cbabi Bayoc talks about the pressure of committing to "365 Days." This past weekend’s Father’s Day reminds us of the important role fathers play in the lives of their children. Artist and businessman Cbabi Bayoc is the father behind 365 Days With Dad. 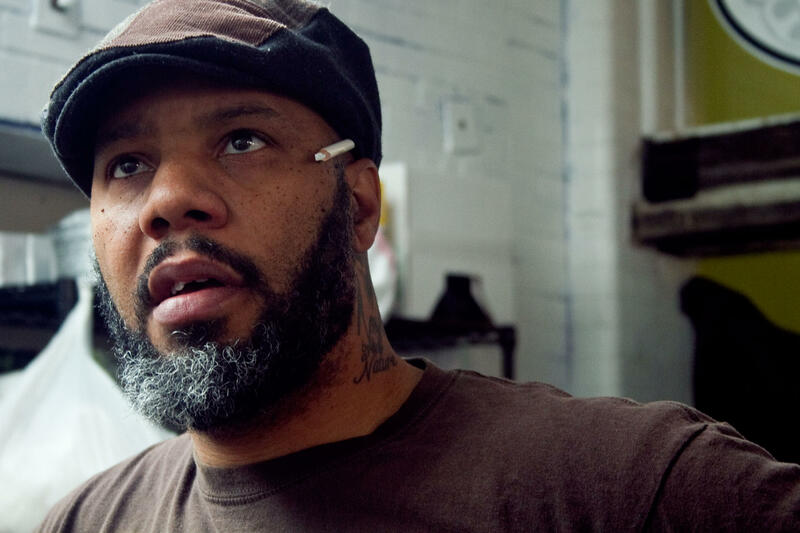 It’s a project he started in 2012 with the goal of painting one portrait or narrative a day which depicts African American fathers interacting with their children in a positive light.